Austin’s Catle Company is pleased to provide an event planning professional at each of our unique locations. This means you’ll have an expert to rely upon who will provide guidance as you begin planning your event. Whether you rely upon assistance, or go it alone, it’s always a good idea to consider the following as you start planning your event! Set the Event Goals: Communicate as much information as you can regarding your event to your event planner, be it a 3rd party meeting planner, or your venue’s in-house event planning professional. Define the goals (general) and objectives (specific) of your event. Define the stakeholders. Who will this event benefit? Define the audience. Who is coming to your event? Is it your family, your customers, your employees, or your executive team? Are they arriving via car, motor coach, or on foot? Will there be children in attendance and if so, how many and their ages? What accommodations would you like made for them? Provide any absolutes: we must provide a vegetarian entrée – or we absolutely don’t want white linen. What is the total budget and how do you see it allocated? Some items you may need to budget for include food, beverage, audio-visual, floral, linen, décor, entertainment, photography, invitations, transportation, etc. Don’t forget – most services will be taxed and some, such as food and beverage will also have a service charge levied (which typically includes the gratuity for your staff). Understanding your budget will allow your event planner to customize the best event just for you. Date: Identify any competing events that may draw your audience away. Time: Select the time that will be most convenient and appropriate for your audience. For example, rush hour on Friday night may not encourage attendance if location is outside of town, however, in the downtown core it may be optimal timing. Location: Select a venue appropriate to the occasion. For example, a corporate meeting may not require a beautiful view, however, a gathering of your best customers may garner a higher attendance if the view or location is a draw. Whether your event is for your family, your customers, your employees or the public, define how you will communicate the event information to your attendees. Will it be online invitations, printed invitations, website, email, etc? Invitations and promotion: Remember to include an RSVP date! Event details: Transportation, guest speakers, audio-visual, entertainment, decorations such as flowers and linens, and the agenda/timeline. Catering: Your budget, the time of the day, and environment you wish to achieve should all be considered when determining the food service. A working lunch – the food service should take little time away from the meeting and should be simple such as a served entrée salad & light dessert. A networking gathering – serving a heavy hors d’oeuvre buffet during an event occurring over the dinner hour will allow guests to mingle while eating. An educational presentation – serving a seated dinner allows your guests to relax and enjoy a full dinner while listening to a presentation. 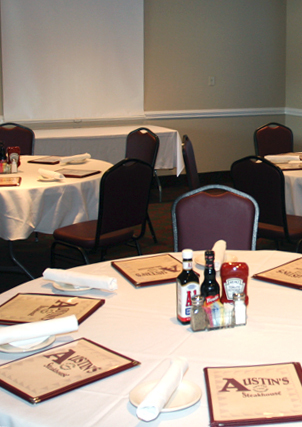 A seated meal can be less distracting than a buffet. Deposits, contracts and final payment due dates. Guarantee due dates: Most companies have deadlines when a final guarantee of guest attendance is due, you should plan accordingly when setting the RSVP date on your invitation. Printed materials such as name badges or programs. Survey, evaluation or follow up: How will you measure guest satisfaction? It is best to have a plan in place prior to the event. When the event concludes, an evaluation can be waiting in an email box or mail. Evaluations sent in a timely manner are more likely to get a response. Most "simple” events can be planned yourself, with the assistance of your venue’s in-house event professional. However, some events require vast amounts of time – and represent large expenditures. Consider your time and expertise in this area to help you determine if you need to hire a professional event planner.